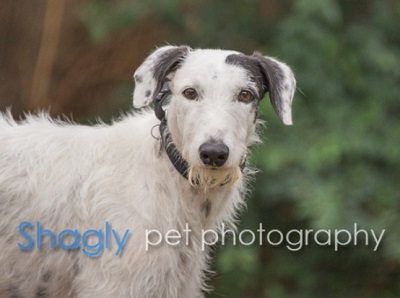 Rodney is an almost 3 year old white and black male greyhound mix. He was a stray near Wharton, TX and two very kind individuals worked for quite some time to catch him. During that time, he was shot in the foot and endured other attempts to harm him. He was finally caught by putting a sedative in his food. GALT was called, and our volunteers sprung into action to help him and treat his wounds. He is undergoing further medical evaluation and we are expecting DNA test results soon. It is not known at this time if Rodney is small animal or cat tolerant. Please check back often for updates. 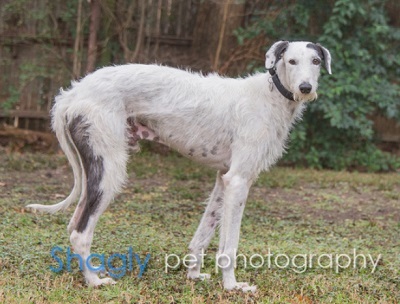 Rodney is a very special dog – likely a mix of greyhound and borzoi with his cute fuzzy coat. He will make an excellent family dog as he has made friends with everyone in his foster home. He has a very sweet disposition and he is smart and fun loving. His white and black coat is soft and he has the cutest spotted belly! 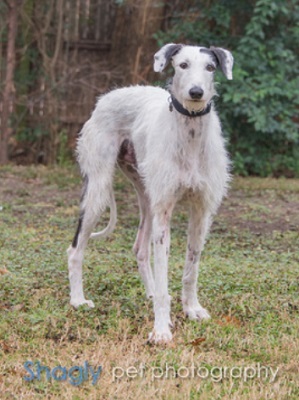 Rodney enjoys being around other greyhounds and large dogs. He loves to play with toys and play chase with the other dogs. He has a laid back personality and is okay being the non-dominant dog. He loves affection and attention from all of the members in the household, but isn’t a Velcro-type dog. Rodney does not enjoy his dog crate although he will go in with a little treat coaxing, as it makes him nervous and can be a hazard if he tries to escape (a solid airline crate instead of a standard wire crate can be used if crating is a must). Rodney roams free in the house when we are home and is rarely destructive although he does like to see what he can grab like toys and blankets. He has made great progress with his potty training since he joined his foster family, walks well on a leash, loves his food, has not shown any food aggression though he is a counter surfer - so leave no food unattended. Rodney is still getting used to the noises in the house such as the television, but he is quickly adjusting. Rodney is a terrific, fun-loving dog who will flourish with a family who can give him attention and a yard to play in. He also loves to bask in the sun outside!